The week-long project also involved authorities from local communes and the district Forest Protection Department. It was held in December 2011, inside the critical habitat zone of the endangered Francois’ Langur (Trachypithecus francoisi). collect information ‘on location’ and conduct ground-truthing. Photos (at top): 3D mapping process steps 1-3, (from left to right): (1) trace contour outlines; (2) cut cardboard along contour lines; and, (3) glue cardboard layers to form 3D model. Photos (above): 3D mapping process steps 4-6, (from left to right): (4) glue crepe paper onto 3D model; (5) paint areas according to participant-defined legend; and, (6) map nearly finished. The target Francois’ Langur live among limestone karst outcrops in the Lam Binh Forest area, right next to agricultural lands. It is therefore important to make sure that land-use is compatible with conservation of the langur’s critical habitat. Land-use mapping can help deter or minimize disturbance to langurs by clearly showing agreed protection and non-disturbance areas. Mapping can also help identify suitable locations for projects such as tree planting and grazing management near the edges of the langur’s habitat. 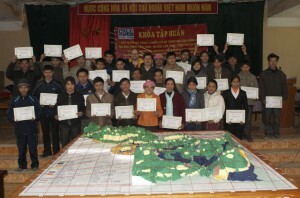 The 3D mapping project increased participants’ ownership of Francois’ Langur conservation in their local area. Local people themselves helped decide how to protect langurs from agricultural expansion and unwanted disturbance. They also identified places where they had seen langur groups, revealing that up to ten groups of langurs possibly live within the Lam Binh forest area. The completed 3D map is now prominently displayed in a local commune’s cultural hall, acting as a reminder to the wider community of the need to conserve the Francois’ Langur. Future community conservation projects will use the map for awareness-raising and environmental education. PRCF Vietnam also prepared copies of voluntary ‘no hunting’ agreements for participants to sign if they felt strongly enough about conserving the Francois’ Langur. The agreement included information about the species, its legal status in Vietnam and reasons for its conservation. We were very pleased that all participants signed the ‘No Hunting of Francois’ Langur’ agreement and registered their interest in joining future activities. This agreement is an important step toward engaging the local community in biodiversity conservation, with a special focus on the Francois’ Langur.